Fibre for Regularity and can help lower cholesterol levels. Qty FREE International Delivery on all regular sized orders when you spend over $120. Put the correct measure (see dosage) into an empty glass. Fill glass with at least 250ml of liquid. Stir briskly and drink promptly. If mixture thickens, add more water and stir. Taking this product without adequate fluid may cause it to swell and block your throat or oesophagus and may cause chocking. Do not take if you have difficulty swallowing. Restores regularity - Made from the husk of natural psyllium seed. 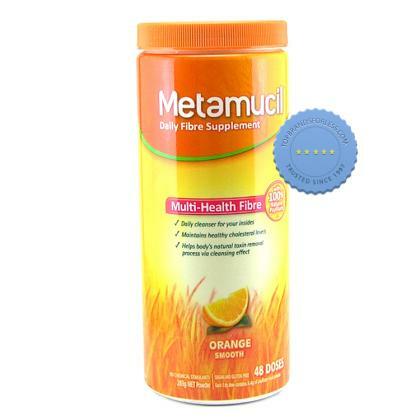 Metamucil works in the same way as high fiber foods. It provides the bulk to digest food, which helps it move through the digestive tract at a normal rate. An adequate intake everyday helps promote a healthy digestive systemTo help lower cholesterol levels - Diets low in saturated fat and cholesterol that include 7 grams of soluble fiber from psyllium husk, as in Metamucil, may lower cholesterol levels. Reductions in cholesterol may contribute to reducing the risk of heart disease. Are there any warnings or precautions? In case of overdose, seek professional help or contact the Poison Control center immediately. Take two hours before or after ingesting any medication to minimize any effect on drug absorption. As your body adjusts to increased fiber intake, you may experience changes in bowel habits or minor bloating. Before using this product, consult a doctor if you: have a sudden change in bowel habits persisting for 2 weeks or have abdominal pain, nausea, vomiting or rectal bleeding or are considering it as part of a cholesterol-lowering program. If you experience chest pain, vomiting or difficulty in swallowing or breathing after taking this product, seek immediate medical attention. May cause allergic reaction in people sensitive to inhaled or ingested psyllium. Relief from persistent pain of osteoarthritis . Contains higher dose of paracetamol .